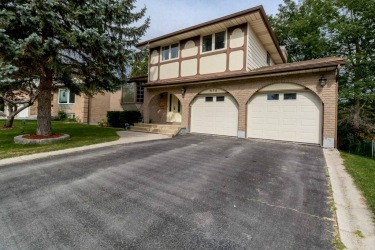 fantastic location in kingstons west end close to schools, parks, shopping and transit resides this beautifully updated 5 level split home situated on an over sized premium landscaped lot that has something for everyone to enjoy. main level offers open concept, vaulted ceilings, foyer and powder room with updated ceramic flooring throughout. formal dining/living with updated laminate, kitchen offers breakfast nook, maple cupboards, granite counters and gas stove. family room offers newer laminate floors, wood burning fire place for those cold winter nights and french doors to the fabulous deck. upstairs you will find a beautifully updated spa like main bathroom, 2 generous sized bedrooms and large master with fantastic walk in closet and cheater door to the bathroom. lower level offers, updated rec- room with walk out to the private back yard oasis, 4th bedroom, full bathroom, den/office, laundry utility and storage. move in ready awaiting the next proud owners!